Produktinformationen "Eingorn, A Rock-Solid Chess Opening Repertoire for Black"
Playing as Black in a game of chess can be difficult. Do you simply try to neutralize White's initiative, or go all-out to complicate the game Either way, there are many pitfalls, and a lot of study may be needed. In this book, Grandmaster Eingorn shows that it is possible both to play solidly, and to take White out of his comfort zone. He recommends ideas and move-orders that are a little off the beaten track, but which he has very carefully worked out over many years of his own practice. The repertoire, based on playing 1...e6, is strikingly creative and will appeal to those who want a stress-free life as Black. You will get every chance to demonstrate your chess skills, and are very unlikely to be blown off the board by a sharp prepared line. All you need is a flexible approach, and a willingness to try out new structures and ideas. Eingorn's subtle move-orders are particularly effective if White refuses to pick up the gauntlet, as Black can then use his delay in playing ...Nf6 to good effect and take the fight directly to his opponent. Viacheslav Eingorn is an extremely experienced grandmaster from Odessa (Ukraine), who played regularly and successfully in the Top League of the USSR Championship in the 1980s. He has represented Ukraine many times in team events, winning a gold medal at the 2001 World Team Championship. Eingorn is a FIDE Senior Trainer, and coached the victorious Ukrainian women's team at the 2006 Olympiad. 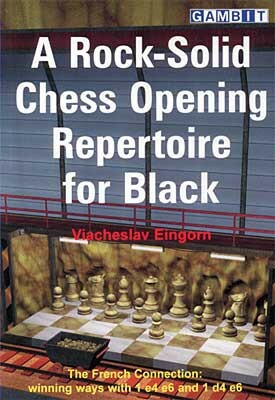 Weiterführende Links zu "Eingorn, A Rock-Solid Chess Opening Repertoire for Black"
Kundenbewertungen für "Eingorn, A Rock-Solid Chess Opening Repertoire for Black"